Presumed to be in the Priest Rapids area. October 16, 1957 view taken during the building of Priest Rapids Dam. Railroad location is on the Hanford Branch south of Beverly. 1965 photo from Milwaukee Road News Bureau. Contractor's locomotive handling cars of ballast near the newly laid out Hiawatha Industrial District of the Milwaukee Road near Royal City, Wash., in the Columbia Basin. By the late Herb Jenkins. 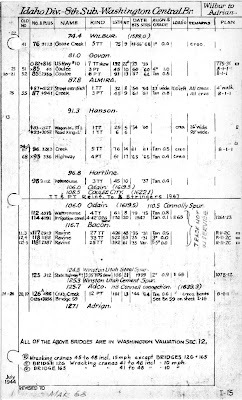 Saturday, June 10, (1966) will be a hsitoric day in the Columbia Basin when the residents of Royal Slope will stage a big celebration to welcome the completion of the Milwaukee Road's 6 1/2 mile spur from it mainline to Royal City. 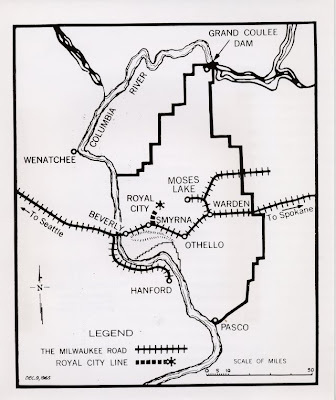 The line, the longest piece of track built by the Milwaukee in the Columbia Basin area since the mainline was completed in 1909, was constructed to serve the 90,000 irrigable acres of Royal Slope in the south part of Grant County. More than 60,000 acres on Royal Slope were harvested last year and produced 356,399 tons of crops valued at $10,913,826. More acres are being brought under cultivation each year. Curtiss E. Crippen, president of the Milwaukee Road, and other railroad officials and local city officials of the area will arrive from Othello at Royal City on a special train at 10 o'clock. A Golden Spike ceremony will be held about 11 o'clock with Mr. Crippen, Harold T. Nelson, Regional Director of the U.S. Bureau of Reclamation, and Dale Smith, president of the Western Farmers Association, participating. A number of federal, state and county officials have been invited to be president. Mayor Sam Poarch of Royal City says "We hope the general public will come to Royal City and assist us in giving a 'Royal Welcome' to this new railroad. We are having a free barbecue right after the Golden Spike ceremony and there will be a dance that evening in the high school gymnasium." Mayor Poarch went on to say the celebration would be held at the Hiawatha Industrial Park, the industrial area set aside along the railroad at Royal city. There will be plenty of parking space available. Mayor Poarch said: "This railroad means more to us than just a connection with the Milwaukee mainline. Some persons refer to it as 'The Royal Road To The Future' and others call it 'The Roal Road to Progress." But whatever name it is called, the railroad will open up a new transportation era for the Royal Slope. We want to show our gratitude by having a large crowd on hand to welcome the Milwaukee." The spur line climbs up through Red Rock Canyon in a spectacular series of curves on a grade of 2.5%. Camera fans may get pictures of the Canyon section of the railroad by driving south from Highway 26 to Smyrna. Trains run again after Columbia bridge pileup. Trains were rolling over Milwaukee Road tracks again following three weekend mishaps, the largest involving 15 cars and more than $500,000 in damage. Security guards were posted over the weekend to prevent looting after winds gusting up to 55 miles per hour through the Columbia River canyon resulted in the derailment of 15 container cars. Railroad officials said 11 of the cars plunged from a trestle about 35 feet down to the water early Saturday. The train had been carrying imported Japanese goods such as stereos, clothing and shoes from Tacoma to Chicago. A check of serial numbers Sunday revealed that one container had been blown off its car from a westbound train Friday night, a Milwaukee Road official said. Soon after the tracks were reopened Sunday morning, a one-car derailment occurred a few miles west, near Ryegrass Summit. Railroad officials said the mishap resulted from a bent coupling bar and involved relatively little damage. 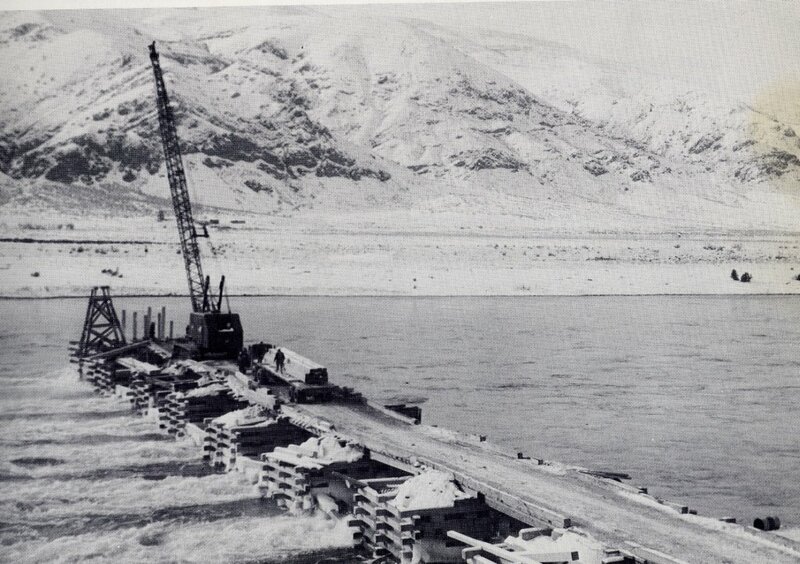 Shown is the contractor's bridge prior to the start of building of Priest Rapids Dam in July of 1956, south of Beverly. After its completion, it carried a Milwaukee Road spur from the Hanford Branch, which left the mainline across the river from Beverly. 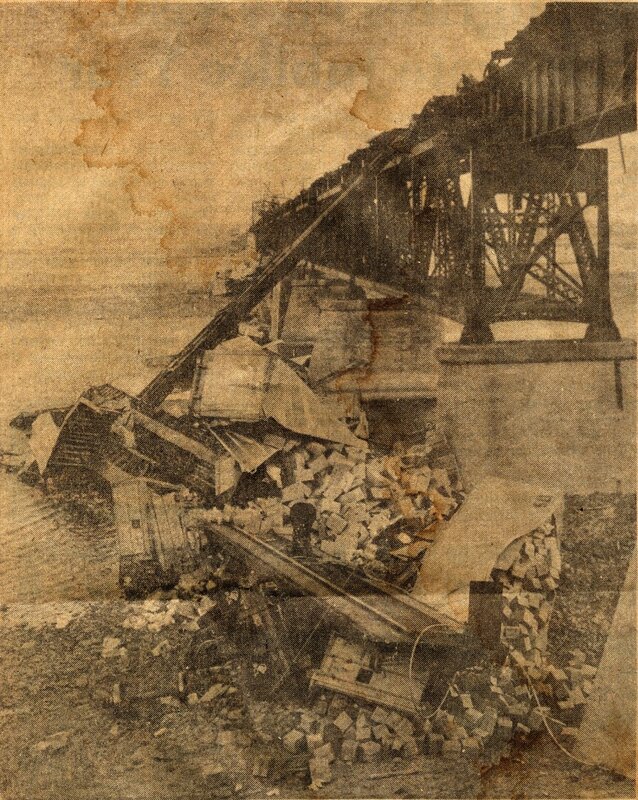 The bridge shown was dismantled in 1961. 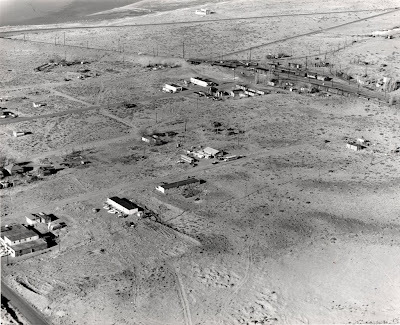 You can make out the Hanford Branch in the background. So I came across this bridge page for part of the CW branch, but some of the numbers and such are a mystery. The 1950s can be considered a time of general decline of the railroad across the nation, as competition from the automobile, trucking industry and airlines took away a great deal of rail business. To be sure, the railroads tried to hold onto as much of it as they could. The period following WWII showed a decrease in rail traffic, but the start of the Korean War in 1950 increased traffic again significantly. On August 27 of that year, President Harry Truman ordered the Army to take control of U.S. railroads to prevent a strike between railroad workers and owners over pay and rule changes; this attempt was largely unsuccessful, leaving the railroads in the hands of the military while the strike ensued for 21 months coincident with the war. Passenger trains also saw a marked decline, despite the new streamliners finally being offered by the railroads, a noted improvement over pre-WWII cars. Introduction of the dome car was another attempt at improving ridership by offering passengers nearly the same view as seen by the train crews up in the locomotives. The first domes appeared on the Milwaukee in 1952, on the NP in 1954, and on the GN in 1955. In Grant County, railroad news was still focused on the Grand Coulee Dam project. Washington State’s highway department and the Bureau of Reclamation had undertaken the relocation of the highway between Coulee City and Grand Coulee at an estimated cost of 4 ½ million dollars. 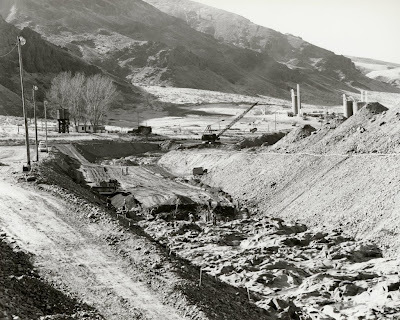 The largest highway project the eastern side of the state had ever seen, it was to include seven bridges and would be able to handle the heavy trucks which would now carry equipment to and from the dam site; the government railway on the coulee floor was to be abandoned when the new irrigation reservoir flooded over it. The new highway along the coulee wall was due to be finished in the latter half of 1950. As part of the track removal project, a trans-shipment building was constructed at Odair for the Bureau of Reclamation. The 75-ton, bridge-type crane inside the station would transfer equipment from railcars on the Northern Pacific siding to trucks, for the remaining leg of the journey to Grand Coulee Dam. Bids for the construction of this building were opened in June of 1949, and called for a completion date three months after acceptance. Don Adkins, Inc. of Ellensburg won the bid. The “sagebrush special” or “gopher chaser,” as it was sometimes called, … hauled more than twelve million barrels of cement, approximately 46,500 carloads for the construction of the dam; 77 million pounds of reinforcing steel, and ten million pounds of steel for the 18 foot penstocks, which feed the giant generators of the dam. The article also reported on two employees who had been with the government railroad since its construction in 1934; Mr. Floyd Craig and Mr. Haskell Finch were still employed at the time as conductor and engineer, respectively. At the dam end of the line, crews began tearing out Crick and Kuney’s original construction tracks at river level on the downriver side of the dam. Plans were underway in December of 1949 to make significant improvements to the structure of the river channel, including laying in armor rock in order to protect riverbank stability; the contract for this project went for nearly $1.7 million. A casualty of this necessity was the “famous little tourist train” described in “The Star,” Grand Coulee’s newspaper, on December 29, 1949. Claiming a short run both in history and physical distance, the tourist train had run at river level from the base of the dam toward the bridge downstream. This short line was now to be removed, since all construction at the base of the dam was complete. Soon, the president was involved in matters of war, and the Northern Pacific was quickly distancing itself from any perceived ties to Korea. On its company logo, NP had used the monad – the yin-yang symbol used for good luck in Asian cultures – which was also the centerpiece of the Korean flag. The Coulee City News ran an ad by local agent C.W. Connor explaining the logo choice on October 19, 1950, just four months after the war with North Korea began. The ad claimed that, in America, the symbol had become known as a sign of good transportation. On the Great Northern line, 1951 brought hopeful attempts at increasing passenger service. Winchester built a new depot to replace the smaller shelter from 1945. On June 3, the GN introduced a newly-equipped Empire Builder, complete with five new sets of trains. Meanwhile, GN took the old Empire Builder trains and combined them with another new set, placing them into service as the Western Star, which took over the schedule of the Oriental Limited. The Oriental Limited had been revived in 1947, after being used between 1905 and 1931. All three of these trains were daily visitors in Grant County, on their way through from Chicago to Seattle and back. The next year saw expansion in industry, specifically in Grant County. The Coulee City News reported on February 8, 1952, the addition of a new grain elevator for Centennial Mills in Coulee City. The three steel bins would cost $190,000 and increase storage capacity at the facility by roughly 110,000 bushels. Farther south in the county, a 1600-acre plot on Wheeler Road in Moses Lake became the newest U&I sugar plant in the country, converting sugar beets grown in the region into granulated sugar for both commercial and domestic use. 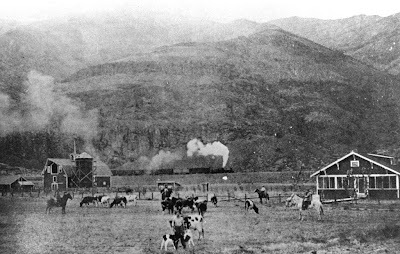 To aid in the movement of supplies and finished product, two railroads built spurs out to the plant. The NP created spur off its Wheeler siding, and the Milwaukee’s spur location came to be called “Scalley,” after U&I’s local manager, Paul Scalley. Not far from this location, the NP suffered a derailment on December 27, 1952, It occurred at Bassett Junction on its old Connell Northern line between Warden and Wheeler where the “Ritzville Branch” to Schrag takes off. There were 3 deaths, all of which were in the locomotive cab, which was crushed. The accident was caused by a defective track switch. Fifteen months later, the NP discontinued its passenger service between Coulee City and Spokane. NP train No. 315 carried 30 passengers into Coulee City on Saturday, February 27, 1954. A daily train carrying mail, passengers and express for 65 years, the return trip carried Mr. Wayne Bolyard, who said the historic ride cost him 50 cents. The NP’s truck service had already taken over in-state cargo shipments, cream from local dairies, and mail service. The Railroad Post Office at Coulee City had officially closed on January 31, 1954. In January of 1955, the Milwaukee Road discontinued the western segment of the Columbian, their Chicago-to-Tacoma secondary passenger train. The train now went no further west than Avery, Idaho. By the end of the year it too was gone entirely. The handwriting seemed to be on the wall, but too many were ignoring it. A few railroads attempted to accept that the truck was the way of the future by offering to move the trailers cross-country via flatcar; a generous compromise, this now-common style of service continues today on all major lines. Other railroads continued to try to improve their fleets in order to save their business. One of these new improvements was the mechanical refrigerator car. Previously, perishable traffic required special cars cooled with massive amounts of ice, which were refilled multiple times en route. The mechanical version used a diesel engine to run a compressor and blowers to cool the car. It only needed periodic maintenance and fuel instead of very expensive ice-making and -storing facilities at strategic parts of the rail network. Then, in June of 1956, President Eisenhower signed the Federal-Aid Highway Act into law, creating a 20-year highway construction project across the country; it was the largest public works project to date. Known as the interstate highway act, it upset the tenuous balance of business between the three forms of transportation available to intercity travelers. Railroads at the time transported 34.8% of passengers, while busses moved 31% and airlines 31.5%. The building of the interstate highway system was a major blow to many railroads. 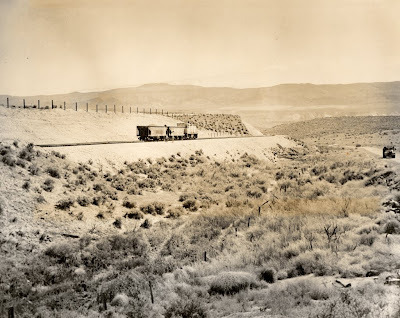 At first trains were used in some areas to transport the materials to build the new roads, but in many cases, those roads were built along existing railroad grades. For example, the Northern Pacific line through the better part of Montana now has I-90 as a neighbor, and also in parts of Washington. This allowed trucks to cruise cross-country on very straight alignments, versus older, narrow, curvy roads that many times followed section lines. That July, the Great Northern discontinued its operation of electric locomotives over Stevens Pass, due to the increasing reliability of the diesel locomotive. The Milwaukee Road continued to use electric locomotives over Snoqualmie Pass, but for a time its Olympian Hiawatha passenger train used diesels from Chicago through to Tacoma. In the Basin, south of Grant County, plans were afoot at the very end of the decade on the NP line. A new branchline across the Wahluke Slope was to carry high projected yields of a number of crops from this newly irrigated area near Mattawa to the mainline at Mesa. The project was scheduled to cost $6 million. The fiftieth anniversary of Grant County fell in a period of both decline and a faint sense of hope for the railroad industry. While passenger service was being cut and electric locomotives were on their way out, diesel engines were on the rise and spurs to new industry was breathing new life into the railroads, not to mention the Basin. It seemed the future was too unpredictable to call.